It all started with one man. Clement Knefel was a major in the U.S. Army, stationed in Germany during the Nuremberg War Crimes Trials, when he learned about the Katyń Forest Massacre. He dreamed of commemorating the victims of this crime with a memorial plaque in Patterson Park. In the early 1970s he began raising money by selling soft drinks and sandwiches at local festivals, collecting small donations, and appealing to veterans’ organizations. He managed to raise $1,600 after 10 years. Major Knefel approached the Maryland Division of the Polish American Congress for help to honor the Katyń victims and all mistreated prisoners-of-war. 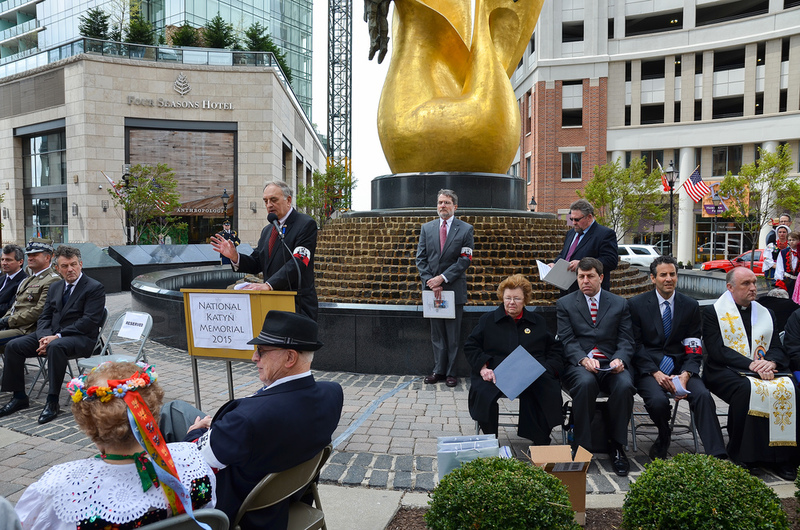 In 1989, the Katyń Memorial Committee of Baltimore was born. The Committee’s first meetings were held at the Polish veterans’ hall on Fleet Street, and those in attendance were: Clement Knefel (Chairman), Melvin Laszczynski, Wojslaw Milan-Kamski (1 st Vice-Chairman), Alfred Wisniewski (Fundraising Chairman), Lucjan Antosiak (Treasurer), Frank Lanocha (Corresponding Secretary), George & Barbara Miegon, Stanislaw & Alfreda Jamrosz, Stella Spies (Recording Secretary), and Stanley May. After a time the meetings were moved to the Polish National Alliance building on Eastern Avenue, and later the group’s headquarters was the storefront of member Josephine Kowzan at 520 S. Broadway. 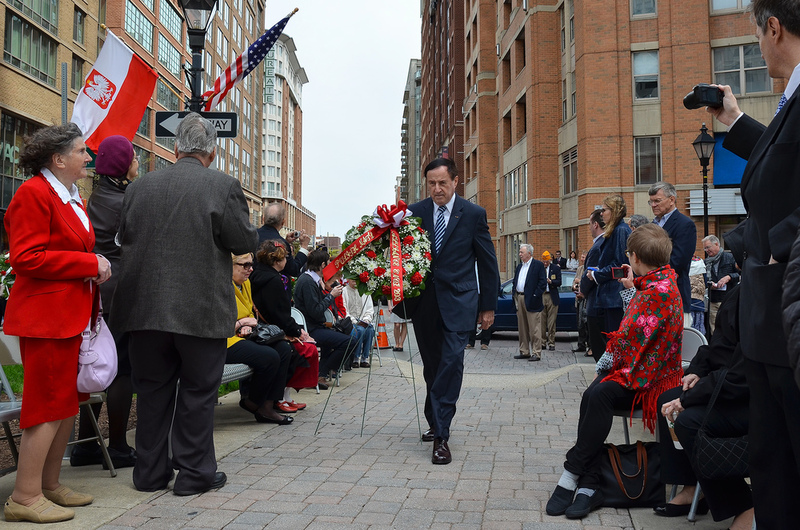 In 1994 the group incorporated in the State of Maryland as the National Katyn Memorial Committee, and it secured 501(c)3 status with the IRS. Clement Knefel resigned due to ill health and died in 1998. He was succeeded by Wojslaw Milan-Kamski, who served for two years. Alfred Wisniewski then became Chairman. Fundraising continued, and help was received from many diverse sources. 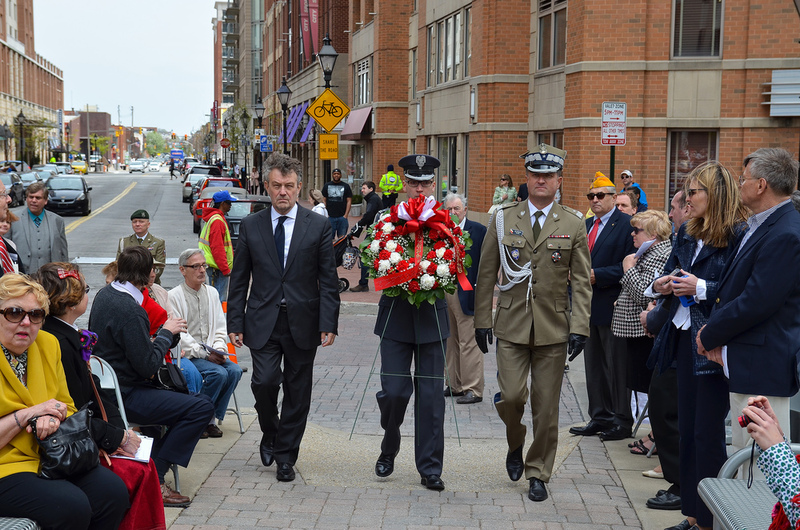 Andrzej Pitynski, a well-known Polish-American sculptor, was recommended by the Polish Embassy to design the memorial. Through the efforts of Senator Barbara Mikulski, Honorary Chair of the Committee, the Associated Jewish Charities contributed a substantial sum to the project. Baltimore Mayor Kurt Schmoke pledged his support and helped the Committee secure the monument site in the Inner Harbor East area. The Archbishop of Baltimore, William Cardinal Keeler, gave Pope John Paul II a Pitynski-made model of the monument when the Holy Father visited Baltimore in 1995. Monsignor Zdzislaw Peszkowski, himself a Katyń Massacre survivor and Chaplain of the Katyń Families Organization in Poland brought to the Site Dedication Ceremony on September 29, 1996 an urn of earth from the mass graves in the Katyń Forest. The Committee decided to seek a grant from the State of Maryland during the 1997 General Assembly session. Senator Perry Sfikas introduced the bill, along with Delegates Carolyn Krysiak, Cornell Dypski, Pete Hammen, and House Speaker Casper Taylor. Lt. Governor Kathleen Kennedy Townsend met with Governor Parris Glendening and secured approval of the grant. Mayor Schmoke provided the final financial guarantee that made the Memorial a reality. Committee members made trips to the GZUT foundry in Gliwice, Poland to oversee the progress of the monument’s creation. The Dedication Ceremony, originally scheduled for September 10, 2000, had to be postponed due to storms and labor trouble that delayed the monument’s delivery from Poland. 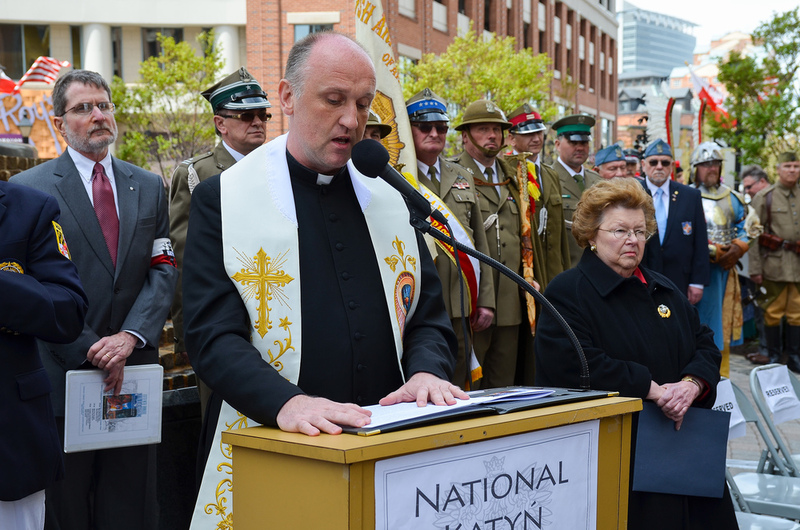 On November 19th, however, Clement Knefel’s dream was realized, as the National Katyń Memorial was formally dedicated at Katyń Circle, after a Mass at Holy Rosary Church. At that time the Committee’s Officers were: Alfred Wisniewski (Chairman), Edward Rybczynski (Vice-Chairman), Henry Wentz (Treasurer), William Krol (Financial Secretary), Richard Poremski (Recording Secretary), and Stella Spies (Corresponding Secretary). The Board of Directors included: Frank Lanocha, James Mislak, Eugene Pawlikowski, Thomas Rybczynski, and Charles Slomski. Active members were: George Bozek, Raymond Dombrowski, Zofi Graczyk, Alfreda Jamrosz, Ben Pokrywka, Patricia Skurzynski, Stanley Sdanowich, Robert Suchy, Frank Wesolowski, and Theophila Zamecki, and Board Members died before the project’s completion were Clement Knefel, Lucjan Antosiak, and Barbara & George Miegon. In 2001, the Committee re-organized itself as the National Katyń Memorial Foundation, and its fundraising activities were supplemented by other, diverse projects. Each year in April, a Remembrance Mass is celebrated, and a ceremony at the Monument is held for the public. The group continues to have information available at community events, at the Polish National Alliance and at the Baltimore Visitor Center. Descriptive flyers and colorful postcards have been distributed and sold. The Foundation’s complete archives have been transferred to the University of Baltimore Langsdale Library Special Collections’ Archives of Maryland Polonia. The Foundation also provided financial support for Monsignor Peszkowski to distribute to every school in Poland a copy of his book, “Katyń w Dokumentach Kongresu USA”. Another major undertaking was the project to create permanent interpretive signage displays at the monument site that more fully explain to visitors the symbols on the monument and the historical background of the massacre. A subcommittee of dedicated volunteers worked long and hard to compose the texts for the signage panels, and local artist, Carla Hazard-Tomaszewski, created striking illustrations to accompany the narratives. Through activities such as these, the Foundation will continue to promote and preserve the story of the Katyń Massacre, so that future generations may learn from this tragic event. “Nigdy Więcej!” – Never Again!